Today NVIDIA officially introduced the GeForce GTX 670, a $399 graphics card based on the 28nm Kepler architecture. This 9.5-inch long card features 1344 CUDA cores, a 256-bit memory bus, 915MHz GPU clockspeed, 980MHz boost clockspeed, and 2GB GDDR5 clocked at 6000MHz. The GeForce GTX 670 has a TDP of 170W. 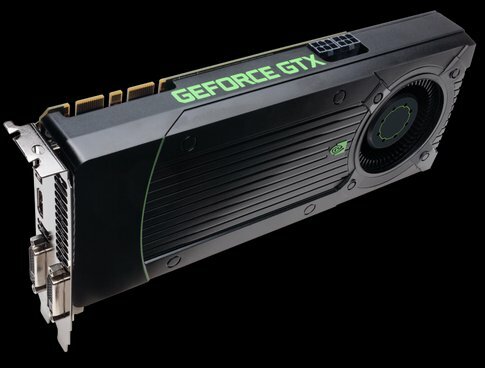 NVIDIA today launched the third GPU based on its next-generation Kepler(TM) graphics architecture, the GeForce(R) GTX 670, which brings dramatically improved levels of price-performance, power efficiency and whisper-quiet operation for PC gamers, starting at $399 USD. Plus, the GeForce GTX 670 ties the competition's much higher-priced flagship product on 25 of the world's most popular games and benchmarks, a testament to the overall performance efficiency of the Kepler architecture. The GTX 670 is built using NVIDIA's 28-nanometer Kepler architecture, as are the GTX 680 and dual-GPU GTX 690, which were introduced in March and April, respectively. Availability The NVIDIA GeForce GTX 670 GPU is available now from the world's leading add-in card suppliers, including ASL, ASUS, Colorful, ECS, EVGA, Gainward, Galaxy, Gigabyte, Innovision 3D, Jetway, Leadtek, MSI, Palit, Point of View, PNY, Sparkle and Zotac. About NVIDIA NVIDIA (NASDAQ: NVDA) awakened the world to computer graphics when it invented the GPU in 1999. Today, its processors power a broad range of products from smartphones to supercomputers. NVIDIA's mobile processors are used in cell phones, tablets and auto infotainment systems. PC gamers rely on GPUs to enjoy spectacularly immersive worlds. Professionals use them to create 3D graphics and visual effects in movies and to design everything from golf clubs to jumbo jets. And researchers utilize GPUs to advance the frontiers of science with high performance computing. The company has more than 4,500 patents issued, allowed or filed, including ones covering ideas essential to modern computing. For more information, see www.nvidia.com. (1) Games/benchmarks tested included: StarCraft II run at a full screen 19x10 resolution with "Ultra" graphics settings; Unigine Heaven 3.0 run at 19x10 resolution with 1x/1x graphic settings; and Dirt 3 run at 19x10 with 1x1x graphics settings. Graphics driver for all tests were AMD Catalyst 12.4 for the AMD HD Radeon 7950 and NVIDIA 301.34 for GTX 670. In StarCraft II, the Radeon 7950 scored 93.2fps while the GTX 670 scored 137.9fps. In Unigine Heaven 3.0, the Radeon 7950 scored 41.1fps while the GTX 670 scored 62.3fps. In Dirt 3, with DX11 enabled, the Radeon 7950 scored 81.7fps while the GTX 670 scored 117.4fps. (2) Comparing TDP of 200 watts for the HD 7950 versus the 170 watts consumed by the GTX 670.